A number of syndromic disorders have renal cysts as a component of their phenotypes. These disorders can generally be distinguished from autosomal dominant polycystic kidney disease (ADPKD) and autosomal recessive polycystic kidney disease (ARPKD) by imaging studies of their characteristic, predominantly non-renal associated abnormalities. Therefore, a major distinction in the differential diagnosis of enlarge echogenic kidneys is delineating ARPKD from ADPKD. ADPKD and ARPKD can be diagnosed by imaging the kidney with ultrasound, computed tomography, or magnetic resonance imaging (MRI), although ultrasound is still the method of choice for diagnosis in utero and in young children due to ease of use, cost, and safety. Differences in ultrasound characteristics, the presence or absence of associated extrarenal abnormalities, and the screening of the parents >40 years of age usually allow the clinician to make an accurate diagnosis. Early diagnosis of ADPKD and ARPKD affords the opportunity for maximal anticipatory care (i.e. blood pressure control) and in the not-too-distant future, the opportunity to benefit from new therapies currently being developed. If results are equivocal, genetic testing is available for both ARPKD and ADPKD. Specialized centers are now offering preimplantation genetic diagnosis and in vitro fertilization for parents who have previously had a child with ARPKD. For ADPKD patients, a number of therapeutic interventions are currently in clinical trial and may soon be available. Polycystic Kidney Disease (PKD) Foundation. Available at: http://www.pkdcure.org/research/clinicalTrials. Polycystic Kidney Disease (PKD) Foundation. Available at: http://www.pkdcure.org. March of Dimes. Available at: http://www.marchofdimes.com. American Kidney Fund. Available at: http://www.kidneyfund.org. National Kidney Foundation. Available at: http://www.kidney.org. American Urological Association. Available at: http://www.afud.org. National Center for Biotechnology Information. Available at: http://www.ncbi.nlm.nih.gov/. National Organization for Rare Disorders (NORD). Available at: http://www.rarediseases.org. Answers appear following the reference list. When present, liver and/or pancreatic cysts may help differentiate early-onset ADPKD from ARPKD. 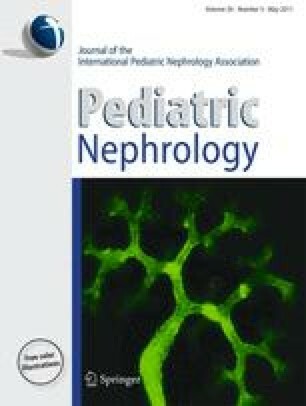 Unilateral disease presentations in children are unique to ADPKD (as compared to ARPKD). If both biological parents of a patient with PKD are older than 30 years and demonstrate no renal cysts, the diagnosis of ADPKD can be eliminated. Most children with ADPKD are asymptomatic, and their major clinical manifestation of disease is hypertension and associated cardiac co-morbidities. The mortality of patients presenting with prenatal oligohydramnios and postnatal severe renal disease is 70%. Given the incidence of pulmonary hypoplasia in patients presenting with severe neonatal disease, intubation and ventilation in the neonatal period should be deferred in favor of a conservative clinical approach. Patients with ARPKD who survive the first month of life have a 10-year survival of >75%. Because a serious and potentially lethal complication of ARPKD is ascending cholangitis, fever and/or elevation of liver function test results mandate prompt diagnosis and treatment. In standard practice ARPKD and ADPKD are diagnosed by identifications of mutations in PKD1, PKD2, and PKHD1. The proteins encoded by PKD1 (polycystin 1) and PKHD1 (fibrocystin) comprise >4,000 amino acids and have a variety of extracellular and intracellular motifs. Gene therapy for ADPKD is not promising given the size of the PKD1 gene and the fact that both increased and decreased expression of PKD1 lead to ADPKD in experimental models. Given the current understanding of the pathophysiology of cyst formation and progressive growth in ADPKD and ARPKD, caffeine, theophylline-like agents, and particularly calcium channel antagonists (for hypertension) should be avoided. Vasopressin antagonists are potentially useful agents to reduce biliary lesions in ARPKD. Promising future therapies for treatment of both ADPKD and ARPKD include: EGFR-axis inhibitors, Src inhibitors, mTor inhibitors, cystic fibrosis transmembrane conductance regulator (CFTR) inhibitors, and somatostatin analogs.